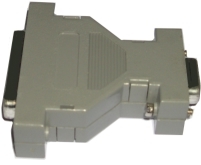 Adapter to convert from a 23-pin Amiga RGB Monitor plug to a 15HD SVGA monitor port. Ideal for use with selected Microvitec Amiga branded monitors equipped with 23-pin plug on the monitor lead. 23-pin Male to 15-pin (High Density) Male.